The first time I was in Spain I was instantly hooked on Padron peppers, it took one morsel and that was it, addiction. Padron peppers come from Padron in Galicia, the north western part of Spain. They are small, bright green peppers with a thin skin and a delicious sweet deep flavour. Summer time is the only season they are available. These little peppers are for the most part sweet but sometimes you might be lucky and get a fiery one that would tantalize the tongue and maybe bring a tear to the eye. These peppers are usually deep fried in olive oil then coated heavily with sea salt and served hot as a tapas (Spanish appetiser). I tried to grow them in my vegetable garden here in Dubai but the soil is not as fertile as it is in Galicia so not hope for home grown peppers. For a healthier option I prefer to coat them in olive oil and griddle them on the stove top or grill them on the barbeque rather than frying them. The flavour is the same but the end result is lighter on the stomach. I always have them as part of my appetisers whenever I find them in Dubai (Carrefour). Last week I served them with Greek stuffed tomatoes and they were a hit. Peppers are very beneficial for our health as they are rich in anti- oxidants, vitamins A, C and B complex and at 20 Calories per 100 g we can afford to eat plenty of it. * Heat a griddle on a high flame until smoking. * Coat the peppers with olive oil and place them on the griddle turning when they start to have brown spots. * Remove from heat when all sides have brown spots, toss with generous sea salt and eat immediately. 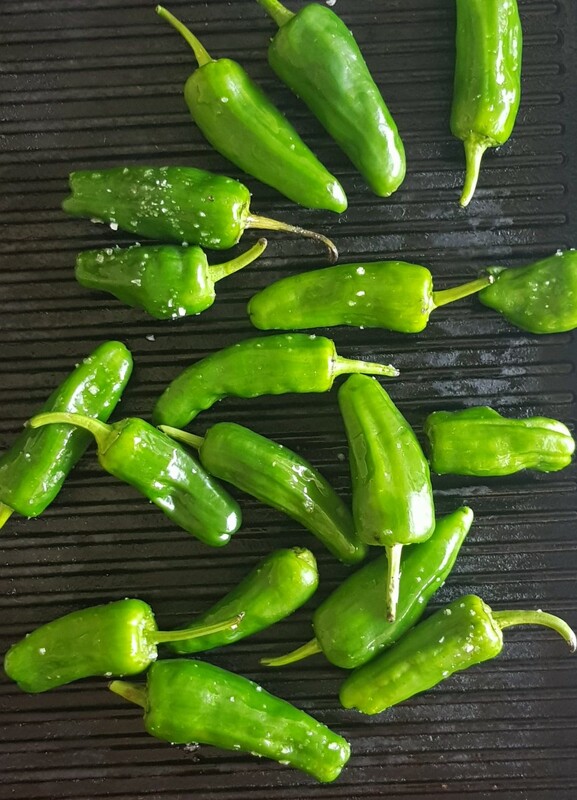 * Any type of small peppers can be used in the event Padron peppers are not available. * You grill on the barbeque for tastier results. Per Serving : 102 Calories; 9g Fat (77.5% calories from fat); 1g Protein; 5g Carbohydrate; 1g Dietary Fiber; 0mg Cholesterol; 2mg Sodium.